Every year is different. This year’s weather from January 1 to April 25 was cold and wet; a stark contrast to last year’s weather. While we know the differences in weather conditions every year, we do not know the implications on soil water and N at planting time. Field operations have just started and it is important to look at where we are today to provide insight to make informed planting and N application decisions. 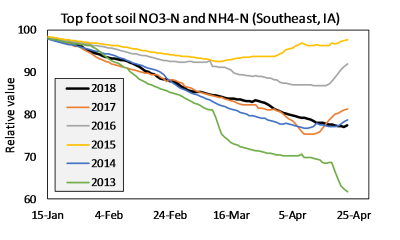 We used the cropping system model used in the FACTS project to compare soil water, residue, and N for 2018 against the previous five years (2013–2017). The locations are: Sutherland and Nashua for northern Iowa; Boone and Kelley for the central Iowa; and Atlantic and Crawfordsville for the southern Iowa. One site per region was pattern tiled (Nashua, Kelley, Crawfordsville). In all sites, the previous crop was soybean, no N fertilization has been applied, and the same starting conditions were used in the simulations each of year. Temperature and Soil Water: Comparing minimum temperatures across years and sites, we found that the 2018 spring frost was similar to 2013 and 2014, however, much different from the 2016 and 2017 years. The 4-inch soil temperature is approaching normal values for this time period (April 25) but the 12- and 24-inch subsoil temperatures are lagging behind normal temperatures by about 6oF. Precipitation from January 1 to April 25, 2018 was the highest of the last 5 years for the central and northern Iowa sites and about average for the southern Iowa sites. In 2018, cold temperatures have resulted in considerably less soil water evaporation compared to the previous 5 years regardless of location. As a result, total soil water in the profile is higher this year than the previous years. The water table depth is near the tile depth for the tile-drained sites; this is shallower than the previous years. The water table is absent at Atlantic while at Ames and Sutherland (sites without tile drainage) the water table depth is about 3 feet or 1 foot shallower than normal. In these two sites, only the year 2013 had a shallower water table depth. Figure 1. 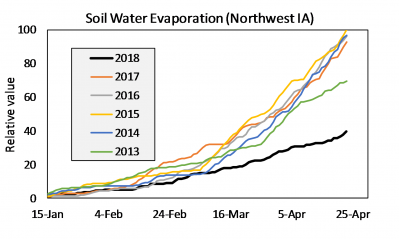 Relative soil water evaporation from January to April 25 from 2013 to 2018 for Sutherland, IA. Residue Decomposition: On average there is about 25% more residue carry-over into 2018 planting than either 2016 or 2017. Residue decomposition in 2018 is the slowest of the previous five years. This is a result of greater snow cover and colder temperatures in 2018. This increase in soil cover will reduce soil water evaporation in 2018 compared to previous years. 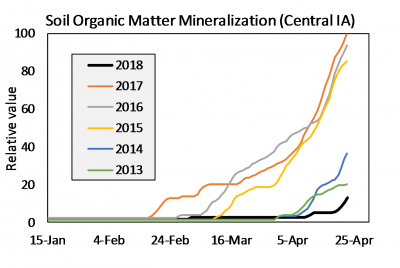 Soil Organic Matter Mineralization and Nitrogen: Compared to the last five years, we have had the lowest supply of nutrients from organic matter mineralization thus far regardless of location (Fig. 2). The low soil organic matter mineralization in 2018 is attributed to low temperatures. 2018 mineralization follows similar patterns to 2013. Soil N mineralization in 2015, 2016, and 2017 had the highest soil N mineralization values, however, followed different patterns. Figure 2. Relative soil organic matter mineralization for Ames, IA from January to April 25 for 2013 - 2018. In 2018, the soil nitrate accumulation in the top foot of soil is lower than the previous 5 years by 10-15 lbs/acre. The 2018 soil nitrate levels are similar to 2013 in central and northern Iowa and 2017 year in southern Iowa. Lower soil nitrate in 2018 is largely due to low organic matter mineralization and nitrification. However, looking at the total amount of inorganic N (nitrate and ammonium) in the top foot, results are different. The soil inorganic N on April 25, 2018 is similar to 2017 and just 5 lbs/acre below the 5-year average across all sites. At a 3 foot depth, the inorganic N on April 25, 2018 was again similar to 2017 and below the 5-year average by about 5 lbs/ac. Figure 3. Relative soil nitrate in the top foot of soil for Crawfordsville, IA from January to April 25 for 2013 - 2018. In summary, our simulation analysis provided an overview of current soil water and nitrogen status. The main message is that most of Iowa is entering the 2018 planting season with more soil water and residue and slightly less soil inorganic N than the previous years. We will repeat this analysis after planting to provide insights into potential in-season N management along with actual soil water and nitrate measurements from field sites.